Buddha Jayanthi date for May 2013 is May 25. 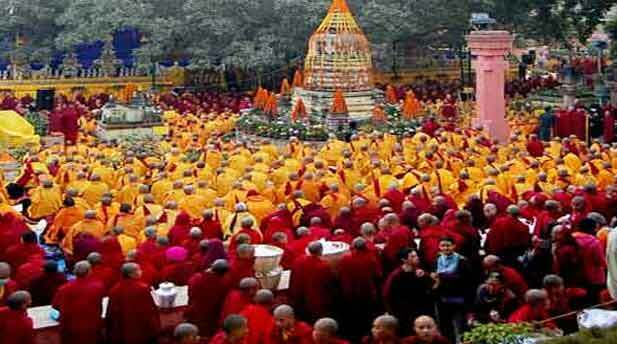 This festival is grandly celebrated across many states of India where Buddhism is followed. This festival usually falls on a full moon day in May every year. The celebrations are held to commemorate the birthday of Lord Buddha. This is among the most sacred festivals for Buddhists. Buddha Jayanthi celebrations in Delhi, Sikkim, Arunachal Pradesh and all other Buddhist sites in India are very festive and grand. The biggest celebrations happen at Bodhgaya and Sarnath (near Varanasi). The celebrations for Buddha Jayanthi mainly include prayer meetings at homes, sermons and religious discussions. Recitation of the Buddhist scriptures with meditation is also very common for the celebrations. Some of the places also have devotees taking processions with the statue of Buddha. The Buddhist temple at Bodhgaya and all other temples of Buddhists are decorated with colorful flowers to bring about a festive look and feel. The special prayers for the day are organized under the Bodhi tree in this temple. It was under this tree that Lord Buddha is believed to have attained enlightenment. Most of the Buddhists hold special prayers with monks on this special day. You can now invite your friends and family for Buddha Jayanthi celebrations with free online invitations from Yoovite. Some of the Buddhists prefer to spend their day in one or more temples. A very interesting ritual that is followed is as follows. Some of the temples will have a small statue of Buddha on display. The statue is kept in a basin of water and well adorned with flowers. The devotees visiting the temple will pour water over the statue to symbolize a pure and new beginning in their life. The Buddha statues in the temples are worshipped with offerings like incense, flowers and fruits. Charity is very commonly followed by Buddhists during this time. Most of them give money, food or clothes to help the poor and needy. Caged animals are bought and set free on this day by some Buddhists. This is done to show their care for all living creatures, as was preached by Buddha. Most of the devotees wear pure white dress on this day. Food for the festival is mostly vegetarian. Kheer is the most popular dish of the day and is served to remember the story of Sujata, a maiden who presented Lord Buddha with a bowl of milk porridge. Yoovite.Com has a wide range of online invitation cards for Buddha Jayanthi available now. The easy to use RSVP option on these cards enables your guests to respond as soon as they see the card.